There has been a great deal of discussion on the subject of the A40 corridor since we were formed just over a year ago, and we are pleased that this topic is now high on the political agenda.We welcome the ongoing improvements to Hanborough Station, including better Park & Ride and more bus links from the A40 and the west. These will enable it to continue providing much needed short term relief, particularly for those living east of Witney. The success of this station demonstrates the potential for further rail connections in the area. We are dismayed however by the recent proposals to dual the A40. Many commuter hours could be saved by providing an alternative to the road itself, like a rail option. We need to stop the narrow minded approach to this problem by our local politicians and start thinking long term instead. WOT supports unconditionally the response of Sustainable Witney to the A40 Corridor Consultation. We have put together a proposal with emphasis on the long term development of our District, offering an alternative link between the Oxford and the Witney area (including Carterton and surroundings). We are mindful that some funding has been earmarked by the Local Enterprise Partnership to alleviate the situation. We believe this is insufficient to complete a large scale project, but if these funds were used wisely they could lay the foundations for future positive developments like those highlighted below. The proposed phased approach below is simply an indication of a possible route. For the purpose of this proposal we have taken the viewpoint of demonstrating the use of as much as possible of the old track. However, especially around Eynsham, Witney and Carterton, we are fully aware there are obvious challenges and other alternatives to these approaches may be more appropriate. The final route decision rests on careful evaluations and studies which are beyond the scope of this initial proposal. For now we just wanted to highlight what we believe are the essential milestones in response to the diagrammatic (and much less detailed) perspective that the LPT4 recently issued by the County Council has provided. We recommend to plan long term, but act short term, maximising the allocated resources. The approach to the Park & Ride, in part utilising the old railway track, should in future accommodate a new track to extend the line (regardless of the chosen mode at this stage) westward towards Eynsham, where another possible Park & Ride could be located (see Google Map below). 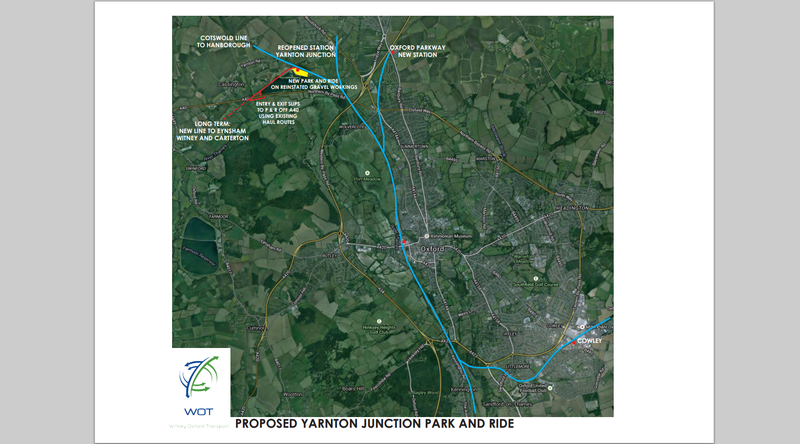 Phase 2 would take the line from the Yarnton Park & Ride all the way to the next modal interchange at Eynsham. We resisted the temptation of going along with the suggestion of proposing the a northern location for a station/park & ride as we felt that our proposal would give greater longer term benefits. The track would for the most part run on the old trackbed. This phase would take the line, utilising as much as possible the old trackbed, close to Witney. Unfortunately there is no way a line could reach the town centre as the old station yard was demolished long ago and it would now be inordinately expensive to rebuild. 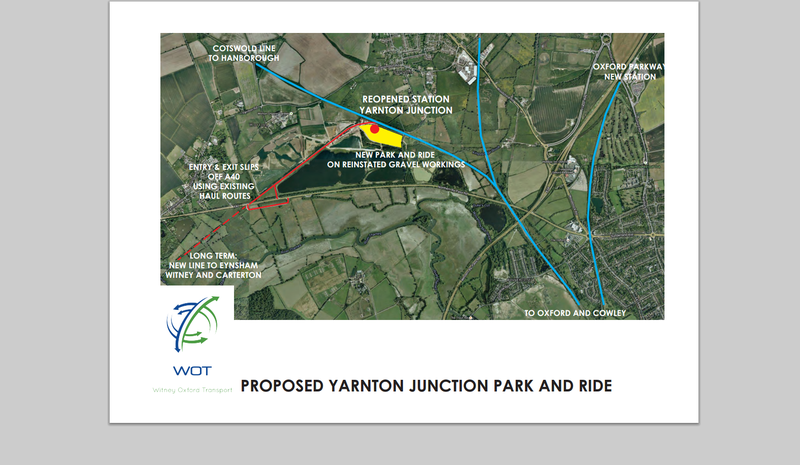 So we are proposing the continuation of the line on a new track to another station/park&ride locate on the western side of the town, in close proximity to the new housing estate, thus providing an opportunity for people to use a variety of transport means to reach Oxford and beyond. Several options are possible to complete this phase, some would entail using parts of the old route towards Brize, while another option (the one highlighted in the map) is to continue with a brand new line, but closer to Carterton (the old line ended where the runaway starts now). It’s impossible at this stage, without an accurate engineering plan, to suggest a definitive route, but we wish to highlight that in order to provide a true long term solution a rail link proposal should address the needs of the local population in and around Carterton. Please click on the map below, the thin red line shows the old rail track. Where this line isn’t showing this is because it has been incorporated in the above proposal.